The main difference between whitetail and mule deer is that the whitetail deer has a dark coloured face whereas the mule deer has a white coloured face. Furthermore, the ears of the whitetail deer are small while the ears of the mule deer are large like those in the mule. 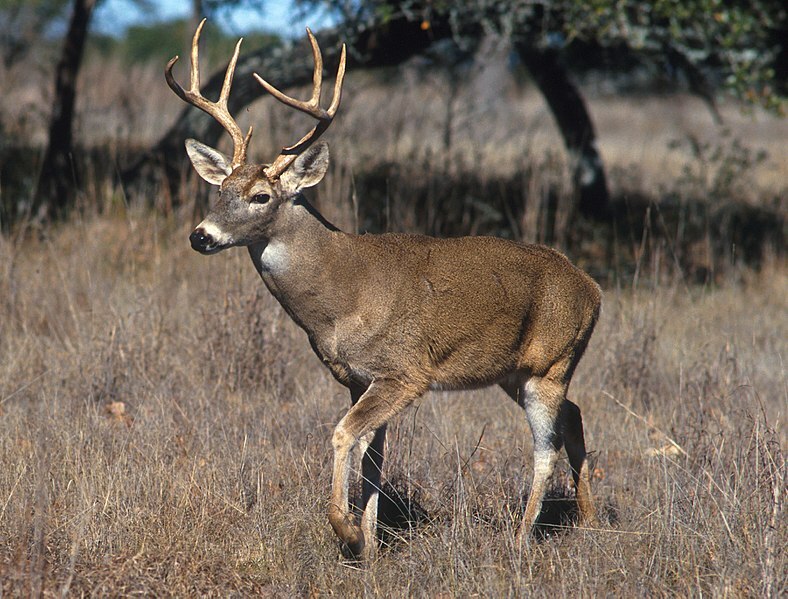 Whitetail and mule deer are two related deer species people often misrecognize while hunting. Both are called bucks as they have antlers. Whitetail deer is a medium-sized deer that lives just about everywhere in North America. It belongs to the Odocoileus virginianus, and is more often called the Virginia deer. These deer mainly live in the east of the Rocky Mountains. Some of them live in the extreme cold, desert or more populated areas. They have a reddish-brown colour fur and the same fur covers their face. Their rump has a less white colour and only the backside of the tail has white colour while the top of the tail is reddish-brown. They raise their tail to signal other deer about the danger. Mule deer are the large deer species that live in the Western part of North America. Its species is called the Odocoileus hemionus while the black-tailed deer is a subspecies of it. Most mule deer live in high altitudes. Their fur colour is greyish-brown and more significantly, their face, as well as the rump, is white in colour. Their tails are also white in colour with a black tip. Moreover, the mule deer get its name due to the large ears that resemble mules‘ eyes. These large ears help the deer to detect far-off dangers and to dissipate heat. 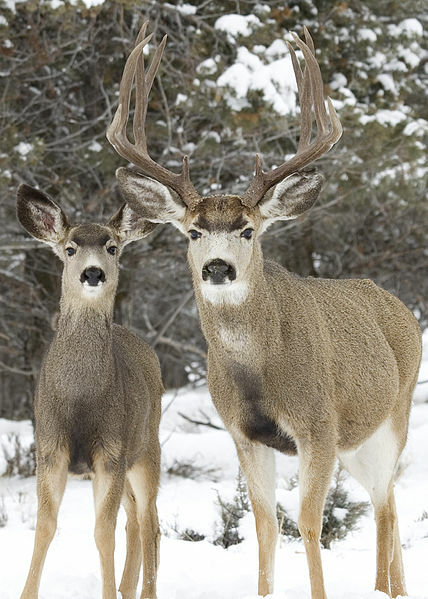 Whitetail and mule deer are two related deer species by their appearance. They belong to the genus Odocoileus. Both are North American deer. Moreover, both have antlers and called are ‘bucks’. Also, both shed their antlers annually. Whitetail deer refers to a North American deer with a rather long tail white on the under surface and the males of which have forward-arching antlers while mule deer refers to a long-eared deer of western North America that is larger and more heavily built than the white-tailed deer. Hence, this is the main difference between whitetail and mule deer. Whitetail deer is Odocoileus virginianus while mule deer is Odocoileus hemionus. Furthermore, a visibly identifiable difference between whitetail and mule deer is that the whitetail deer have a brown coloured face with white circles around their eyes and nose while the face of the mule deer is mostly white in colour. Whitetail deer has a brown rump with a fat, dark tail while mule deer has a rump with a white patch with a thin, white tail. Moreover, the white colour in the tail of the whitetail deer can only be seen when it lifts the tail while the white tail of the mule deer has a black tip. Thus, this is also a major difference between whitetail and mule deer. Another difference between whitetail and mule deer is their tail. The whitetail deer has small ears while the mule deer has large, mule-like ears. Also, the fur of the whitetail deer is reddish-brown while the fur of the mule deer is greyish-brown. Body size is also a difference between whitetail and mule deer. Whitetail deer is a medium-sized deer while the mule deer is a large deer. In addition, the antler points of the whitetail deer grow off from the main stem while the mule deer has dioecious antlers. Moreover, whitetails deer is more aggressive while mule deer is less aggressive. Behaviour is another major difference between whitetail and mule deer. Whitetail deer tends to spook while the mule deer tends to be laid back and less jittery. Whitetail deer is a medium-sized deer with reddish-brown colour fur. The backside of their tail is white in colour. Their antler points arise individually from the main stem. Moreover, they are more aggressive. On the other hand, mule deer is a large deer with greyish-brown colour fur. Significantly, their face and the rump are white in color. They also have dioecious antlers and large, mule-like ears. Therefore, the main difference between whitetail and mule deer is their body size, fur colour, ears, antlers, and behaviour.